The first thing that greeted us at Waffletown was the strong whiff of fried chicken goodness coupled with the sweet, doughy smell from freshly made waffles—we had officially arrived in Heaven. To cool ourselves down, we started off with one of their signature Belgium waffles topped with ice cream (S$2.90). At first glance, you may assume this dish to be immensely basic—well it is—but it was so good. 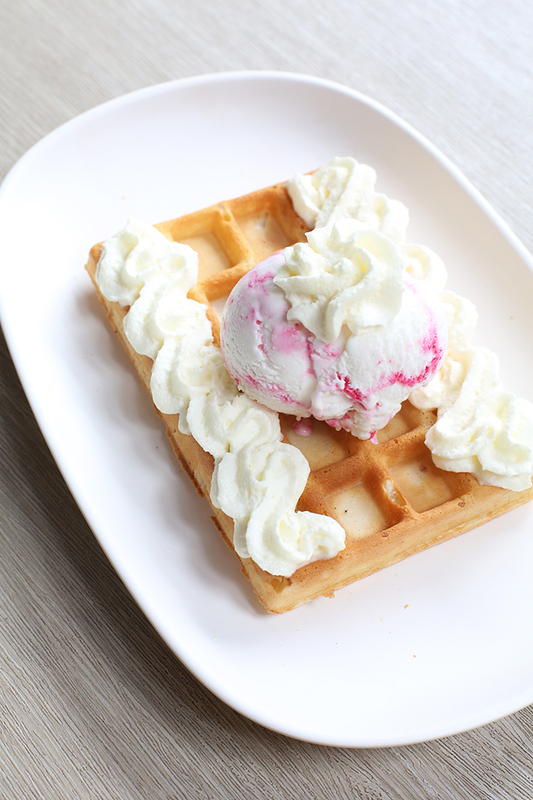 Raspberry ripple flavoured ice cream atop a toasty and crunchy waffle. Perfect for a hot day—or any day for that matter. The two-piece fried chicken (S$8.50) was beyond amazing. Marinated and deep-fried to perfection, the chicken was super crispy on the outside but moist and succulent on the inside. An added bonus is that it was not the slightest bit oily. The sides that came along with it were decent but nothing much to shout about. We also got the Super Value Meal (S$6.80) which consisted of a deep-fried boneless chicken thigh, white rice and a fried egg with a runny yolk. For what it’s worth, we think that it is a pretty good deal considering the large portion size. The chicken was deep fried to perfection and the egg was cooked just right. However, we wish the rice could have been more aromatic and flavourful to better complement the other two components. Waffletown was truly a breath of fresh air. A cosy eatery devoid of the hustle and bustle and pretentious aesthetics, serving comfort food at reasonable prices. We will definitely be back.